« *** WINNERS *** Laura, Debra and Amber are Living the Life of Riley! CONGRATULATIONS! With a toddler and a small, black-haired dog, I have to be diligent about cleaning our carpeted, tile and hardwood floors...or else risk being carried away by a giant crumb-filled hairball! I've owned several vacuum cleaners, both bagless and bagged, in a wide price range. Typically, I love the way the bagless uprights clean, for they tend to have much greater suction power, but they have always been such a mess to clean, that I tend to stick with the bagged upright models. Naturally, I was a little leery of trying the new Eureka Whirlwind 3272AV Bagless Upright Vacuum Cleaner, for it didn't have the typical vacuum bags I was used to. But since I currently own a Eureka, and my last few vacuums have all been Eureka, I was hopeful that this time someone was able to make a bagless upright that I would like. Keep reading to find out if this is the bagless vacuum cleaner for me! I reviewed the Eureka Whirlwind 3272AV Bagless Upright Vacuum Cleaner with Self-Cleaning Telescopic Duster from Eureka, which retails for $119.00, but is currently on sale for $79.99. I also reviewed the DCF-21 Vacuum Filter from Filtrete, which retails for $19.99, but is currently on sale for $15.43 with FREE SHIPPING. I thought that the Eureka Whirlwind 3272AV Bagless Upright was a sleek and stylish vacuum right from the start. I loved the black and gray colors used as well as the transparent canister and vacuum hose. This way, it is very easy to see just how much dirt and hair your vacuum is inhaling for you as well as whether or not something is clogging your machine. The Eureka Whirlwind came with a dusting brush, crevice tool and extension wand, extra belt and self-cleaning telescopic duster attachment. If you go by what the Eureka Quick Start Guide states, you might think that you should also have a Power Paw attachment included, but this isn't the case with the 3272AV model. Since both my daughter and my husband have allergies, I was so excited to use a vacuum cleaner that contains a HEPA filter as well as a dust cup filter. 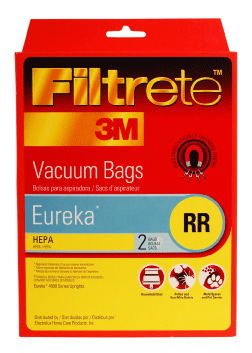 Eureka has partnered with Filtrete, one of the leaders in air filtration, to ensure that this vacuum will not only clean your floors, but also help keep dust, pet dander, allergens, mold and bacteria from being released into the air as well. Because their filters can capture 99.97% of dust and allergens, you can be sure that family members with allergies will breathe a little easier after cleaning with the Eureka Whirlwind. Of course, my favorite feature has to be the Whirlwind Cyclonic Technology partnered with a powerful 12 Amp motor. I couldn't believe the amount of hair, dust, dirt and crumbs that were extruded from my carpets by the Eureka Whirlwind the first time I used it. I didn't even think my carpets were THAT dirty, but the loud snap, crackling and popping noises from the dirt being vacuumed up, proved differently. The Eureka Whirlwind seemed to be inhaling everything in its path...most of which I didn't even realize was there in the first place. I really thought the edge cleaner feature was fabulous as well, for I never noticed anything left behind around the edges of this vacuum cleaner. I was pleased at how clean the areas right against my baseboards and walls were after using the Eureka Whirlwind. This upright weighs 18 pounds, which I didn't find too heavy, and it has a cleaning path width of 13 inches. I loved the 30 foot electrical cord included and found that I could vacuum two large rooms at one time without stopping to relocate the plug. Although I wish this vacuum had a headlight, I was very pleased by the onboard attachments the Eureka Whirlwind had. There was a crevice tool, extension wand and vacuum hose which had a 12 foot reach. Couple that with the included dusting brush, and you've got a powerful assembly perfect for cleaning baseboards, corners, furniture, drapes and vents. The Eureka Whirlwind also came complete with a telescopic self-cleaning duster. In order to make this duster a super-cleaning magnet, simply turn the vacuum on and activate the static charge by pushing the gray lever down on the duster's attached canister. Then, turn off the vacuum, remove the duster and clean away. To clean the duster, reinsert it into its canister, turn the vacuum on again and push down on the gray lever. Presto! All of the dirt and dust you collected is immediately sucked up into the vacuum and you're ready to clean again! This is exactly what I needed to combat the dusty ceiling fans located in every room of my home. Cleaning this vacuum was an absolute breeze too! Finally, I've found a bagless upright that I consider extremely easy to clean after using! Simply open the dust cup and release the bottom lid. The dirt and debris empties directly into your trash can and that's it. No dirty hands either, for with the one touch button on the bottom of the dust cup, you never touch the debris you've vacuumed. Of course, in order to keep your vacuum working like new, you do have to perform some regular maintenance to it, but this is all clearly explained in both the owner's manual as well as on the side of the dust cup itself. You are urged to clean or replace the DCF-21 Dust Cup Filter regularly, which should be easy to do for this filter is actually washable. Your HEPA filter should also be replaced every six months to ensure that the air quality isn't compromised. I am so happy to finally own a bagless upright like the Eureka Whirlwind 3272AV Vacuum Cleaner. This vacuum has an extremely powerful suction due to its dual cyclonic action and 12 Amp motor. It also cleans well around its edges and has some wonderful onboard attachments. I'm also happy that the Filtrete filters used inside the Eureka Whirlwind will help my husband and daughter breathe a little easier too. If you are looking for a top-notch vacuum that won't break the bank, then I highly recommend the Eureka Whirlwind 3272AV Bagless Upright! Disclosure: I received the Eureka Whirlwind 3272AV Bagless Upright Vacuum Cleaner with Self-Cleaning Telescopic Duster and Filtrete DCF-21 Filter from Eureka and Filtrete in order to facilitate my review. No other compensation was received. This product review is based on my own personal experiences with this item and is completely honest and objective. 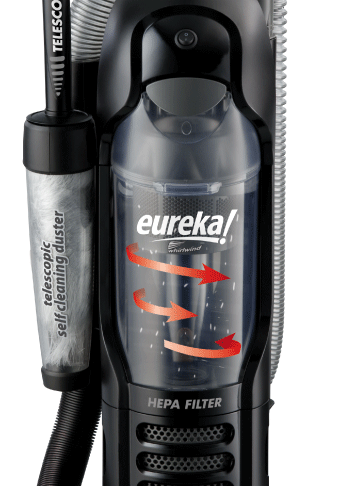 I would like to get the Eureka Easy Clean™ Hand Vac. I follow Eureka on twitter. I like Eureka on FB.